Being part of the Sony Artisans of Imagery Program, I was lucky to have tonight a phone meeting with some of the top Sony engineers who helped develop the very sought after Sony a7R II. And as promised, I asked questions, and they answered. Some of these questions were asked by YOU!! So thanks a lot, and let’s get to the point! Is the Dynamic Range better and noise level lower than that of the a7R? Is the higher sensitivity going to be detrimental to noise level? ➡ No! 1/ In the new design, the photodiodes are closer to the surface of the sensor, and that allows them to detect more light, hence a higher sensitivity. This sensor has a better detection rate in low light conditions than a “regular” sensor. 2/ The change of materials to connect the diodes to the rest of the electronics ensures a lower noise level as well. They did not go into specifics but these seem to be a two key points. Will the a7R II replace the a7S in terms of image quality at high sensitivity? What about a low pass filter? ➡ I was absolutely amazed to hear them say that the shutter of the a7R II is expected to last more than 500K cycles!!! Yes, you read it right: 500K as in more than HALF A MILLION CLICKS!! Does it work also for 3rd party manual or automatic lenses? ➡ Yes! 5 axis stabilization works for native and 3rd party lenses, for both photography and video! How much compensation can we expect thanks to the IBIS system? Can it be turned on and off at will? Is the new build more resistant? 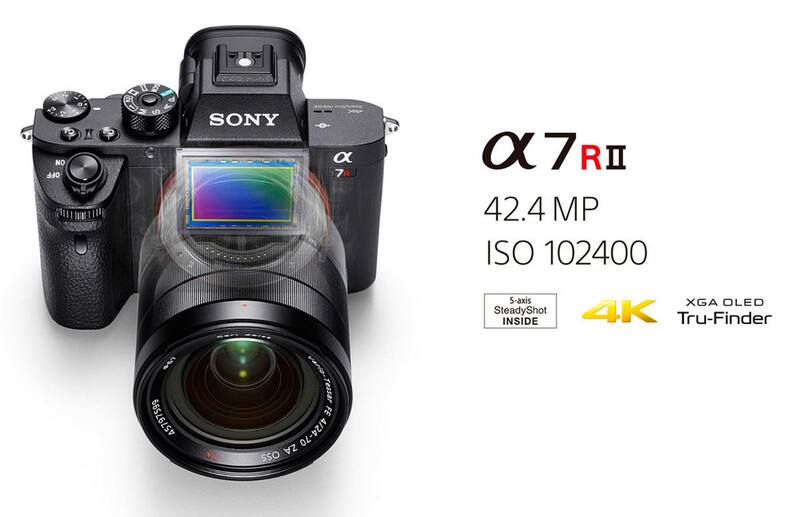 ➡ Its design is slightly different and I’m very excited we were told they fixed the light leakage issue they had with the a7R body! ➡ Still only one, located at the front of the body. Is it still going to be on all the time during long exposures? Will there be a timer with a count up during long exposures? ➡ Some have raised the question as to if Sony lenses are build to provide a high enough resolution for high density sensors. We had the confirmation that the lenses had been designed with this particular aspect in mind. The engineers are confident that the optical quality of the lenses is more than sufficient for high resolution sensors. ➡ We were confirmed that AF of Canon lenses was “much faster than before. With adapters (and in particular with a firmware updated Metabones mark IV) Canon lenses are almost as fast as on a Canon body“. ➡ We were also told that the adapter for Sony A mount lenses made the AF very fast, but slightly slower than on an A mount body. We were told that “A mount lenses will find another life thanks to it”. Alright, this is all for now!! I hope this helps you get a better idea than before about the very exciting new tech coming inside the new a7R II ! I am definitely excited about this new power horse, and can’t wait to get my hands on a copy. We were told that shipping should start around late July. If you have questions, remarks or would like to discuss any particular aspect, please leave a comment below! This entry was posted in Article, Behind the Scenes, Gear, Promotion, Review, Sony, Text and tagged a7RII, annoucement, article, behind the scenes, Gear, how to, phone camera, promotion, Sony, text on 06/15/2015 by thibaultroland. Really looking forward to the new camera and really looking forward to your work with it. Excited! Thibault, Thank you for this. A question though: Are you using the phrase “Read Out Speed” to refer to the time it takes to clear the buffer of the A7R II? I think I read somewhere that it is capable of 5 frames per sec to shoot, with a burst of up to 22 consecutive frames before the buffer bogs down and has to clear itself. Any comments? I suspect they did not include you guys because they new you would ask too many pointed (and good) questions LOL. More seriously, this is indeed unfortunate 😦 I wish you could have been part of the discussion! I am not sure about the buffer, Mark, as they did not tell us is so many words. What I can say though is that the camera can do internal 4K, which suggests that the buffer speed should also be faster than that of the a7R. Anything on RAW file size? Hey Adam! This aspect was addressed but only in passing. I can’t really tell much about it because they only said that a formal announcement from Sony will be done in the near future. They did not give any detail about it…. sorry!! T.Rol oh yes. It works fine. LCD totally off. And, what’s better, is when you’re away from the camera, so is the EVF! Saves battery, as well. Not a bad thing at all. I’ve gotten used to walking around like this. Screen off, EVF off, but you put your eye up to the viewfinder and it switches on. I love the system. – lorsque l’on monte un objectif Sony OSS (par ex un Zeiss 16-70) sur un A7II (le recadrage sera en Aps-C) QUEL STABILISATEUR SERA MIS EN FONCTION, celui de l’objectif ou celui du boîtier ?? – lorsque l’on monte un objectif manuel ancien au moyen d’un adaptateur, il faut en programmer la focale sur le stabilisateur. MAIS NE FAUDRAIT-IL PAS AJOUTER L’EPAISSEUR DE L’ADAPTATEUR EN MILLIMETRES A LA FOCALE DE L’OBJECTIF ? Merci à tous ceux qui auraient une réponse précise et pas des ragots ou des élucubrations. –> a ce jour, cela n’est pas clair. Par contre, je pense qu’il faudrait regarder la situation avec le a7II, qui est en gros la meme. Je ne suis pas totalement familier avec le fonctionnement de ce boitier, mais si je ne me trompe pas, il devrait etre possible de choisir de mettre en route ou d’eteindre la stabilisation de facon independante sur l’objectf ou le boitier. C’est un point a verifier, mais cela voudrait dire que l’on peut choisir lequel des deux fera la stabilisation. Je pense qu’il est plus interessant d’avoir la stab sur le boitier et non l’objectif, mais c’est a prendre avec des pincettes. –> je ne pense pas non, car l’epaisseur de l’adapteur n’est la que pour faire en sorte que l’objectif soit a la bonne distance du capteur pour avoir la focalisation a l’infini. Une autre facon de le dire est qu’il n’y a pas de raison de changer le reglage du stabilisateur pour une meme focale si l’objectif est un Canon ou un Mamiya par exemple. C’est toujours la focale qui est importante, pas la distance entre l’objectif et le capteur (en ce qui concerne cet aspect). Mais la meilleure solution est de regarder comment les choses se passent avec le a7II, qui lui aussi fonctionne de cette facon. A propos de l’épaisseur de la bague, je suis convaincu qu’il faut l’ajouter à la focale et voici pourquoi : le tirage d’un 35mm par exemple est totalement différent selon la marque, un Leica M n’a absolument pas le même tirage à l’infini qu’un Leica R, donc c’est impossible que l’affichage de “35” sur le stabilisateur du boîtier donne les mêmes résultats. Remarque : Sony France est incapable de répondre à des questions simples du genre “un PZ rétractable 16-50 fonctionne-t-il correctement sur un A7II, excepté le recadrage auto en Aps-c” ? C’est un vendeur HongKongais qui m’a très gentiment donné la réponse (non). En fin de compte “mon” boîtier idéal (et le dernier je pense car il comporte tout ce que je veux) est en fabrication et je l’ai commandé : A7rII. La définition de mon actuel A7II est un poil juste, sinon c’est un excellent boitier à tous points de vue. Depuis la sortie du tout premier A7, les utilisateurs se plaignent de la gamme optique trop restreinte et ça ne s’améliore pas vraiment, le 24-240 est monstrueux pour une utilisation quotidienne, dommage, à mon avis un 24-140 aurait été nettement préférable.